Advancis® FlexiJoints Max is a food supplement that contains a complex of rapid absorption Glucosamine and Chondroitin, Methylsulfonylmethane (MSM) and hyaluronic acid, substances that are physiologically present in the human body and that promote the balance of cartilages. 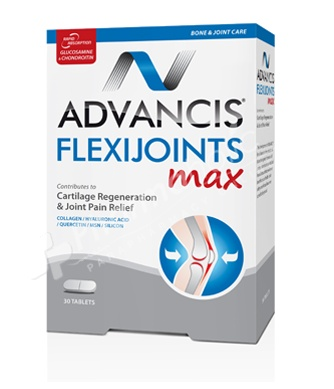 Description: Advancis® FlexiJoints Max is a food supplement that contains a complex of rapid absorption Glucosamine and Chondroitin, Methylsulfonylmethane (MSM) and hyaluronic acid, substances that are physiologically present in the human body and that promote the balance of cartilages. It also contains silicon and quercetin. 1 tablet a day, preferably in the morning at breakfast. If necessary, the dosage can be increased to 2 tablet per day. Rapid Absorption Glucosamine 45,5%; Rapid Absorption Chondroitin 12,1%; Methyl-Sulfony-Methane (MSM) 12,1%; Anti-caking: Tricalcium Phosphate; Marine Collagen 6,1%; Anti-caking: Corn Maltodextrin; Gelling Agent: Microcrystalline Cellulose; Disintegrating Agent: Reticulated Sodium Carboxy-Methyl- -Cellulose; Hyaluronic Acid 1,8%; Silicon Dioxide 1,3%; Binder: Wheat Starch; Anti-caking: Magnesium Stearate; Quercetin 0,9%; Anti-caking: Magnesium Silicate. Should not be taken by patients allergic to shellfish/shellfish products. Should not be taken during pregnancy and breastfeeding as well as in children. Should not be used in case of hypersensitivity or allergy to any of the constituents of the formulation.